Mid way through 1997, the Australian labour movement lost another if its most treasured woman activists, Eileen Powell. Amongst much else, Eileen played a prominent role in the 1930s and 1940s in improving the pay and conditions of.women employed in railway refreshment rooms. In the following tribute to her union work, Jim Walshe, secretary of the Australian Railways Union between 1981 and 1992, recalls Eileen’s contribution to advancing the cause of social justice for women both within and beyond the workplace. On Thursday, 24 July we paid a final tribute to Eileen Louisa Powell who had passed away as quietly as she had lived. She was unswerving in her determination to right the wrongs that women experienced in the workplace. Eileen was appalled by the unfairness that had been evident in the wages and conditions women had experienced from the early days of this century. She was the product of a broken home. Her mother was divorced and left with two girls and a boy to rear but still found time to attend Labor Party meetings. When Eileen was eight years old she would accompany her mother to ALP meetings and it was only natural, when she reached the appropriate age, that she joined the Party. Whereas most young girls of her time would get enjoyment from going to cinemas or dancing, Eileen would attend meetings of feminist, genealogical or historical societies or indeed any meeting that took her fancy. At the age of 14, she got a job at Grace Bros, Broadway as a shop assistant. In the evening she learned shorthand and typing and not long after she obtained a job with the Labor Daily newspaper. In 1929 she joined the staff of ALP Head Office and remained there for seven years. During that time she was secretary to Jack Lang for a short period. In 1937 an opportunity arose for a job in the powerful Australian Railways Union (ARU). Whilst the State Secretary, Dr Lloyd Ross, was technically the editor of the union’s journal, Railroad, the practical work of putting the paper together, including layout, was left to people like Eileen Powell. The reports coming from Reps and Sub Branch secretaries had to be rewritten for use in the journal. The stories of hardship of members generally and women in particular excited her interest to the extent that Lloyd Ross sent her out on a fact finding missions on Railway Refreshment Rooms (RRR). What she found was to lead to the first major case in the Industrial Commission for women workers in the Railway. Australia was among the first countries in the world to give women the right to vote \;>ut that right did not reflect itself in wages and conditions of work, Books have been written on the reasons why this occurred. Suffice it to say that women in the RRR were no different to their contemporaries in that they only received 54% of the male basic wage as laid down by the Arbitration Commission in 1912. What did set them apart were the conditions under which they had to work for this pittance. Prior to 1916 the RRRs were not operated by the Railways Department but were leased to private individuals. When the Railways Department took over complete control in 1916 the RRR remained outside the ambit of the Railways Act and that affected the conditions of its employees relating in particular to permanency and right of appeal against dismissal. Other conditions such as Sick Leave were also affected. The right to “hire and fire” was retained by the local RRR manager. Because of its historical background, the RRR was under-organized and the workers reluctant to approach the union. The fear of instant dismissal deterred workers from seeking union assistance. These were just two of the impediments that Eileen faced in her fact-finding mission. She did hasten to add, though, that the nlajority of RRR managers were decent people but there were sufficient of the other kind to cause some problems for her. When she encountered an obstructive Refreshment Room manager she would arrange through the good offices of the local per-way (fettler) or traffic (signalman or porter) representative (rep) to meet the RRR employees 200 yards down the track, in some cases in deep snow. A pamphlet by Lloyd Ross, Life and Work in the RRR, issued after her tour showed some of the terrible conditions encountered: Case (I) spread of 20 hours and 45 minutes but only paid for 9 hours 15 minutes Case (2) spread of 12 hours and 30 minutes but only paid for 7 hours and 45 minutes. Case (3) spread of 15 hours and 30 minutes but only paid for 9 hours. And all of this without proper food. In addition many were required to ‘board’ on the premises and were” charged by deduction £1 from their meagre wage whether they lived there or at home. The boy ‘useful’ was paid junior r’ates until attaining his 21 st birthday, when he got the sack. Eileen arranged for Reps to be appointed to the RRR. In one particular case the woman Rep, who was the daughter of the ARU Sub-Branch Secretary, became so involved in Union activity that she not only opposed her father for the position at a subsequent election but, in fact, won. The ARU took its case to the Conciliation Commissioner in August 1938. The Commission granted a small wage increase but did not address the major issues of length of shifts etc., so the union appealed to the Full Bench. Lloyd Ross was unavailable to present the case and wanted Eileen to replace him but he was worried that the bench might be prejudiced against a woman advocate. Ross sought discussions with the Bench in camera where he received assurances that no such problem existed. This was the first time that a non legal woman had represented the ARU. When the judgment came down they cut the spread of hours, made provisions for overtime, increased wages and abolished the compulsory board and lodging payment. The provision of proper food was also inserted in the award. However, the female rate remained at approximately 54% of the male rate. During World War II she was seconded to the Commonwealth Department of Labour and National Service for one year to help establish the Industrial Welfare Division. 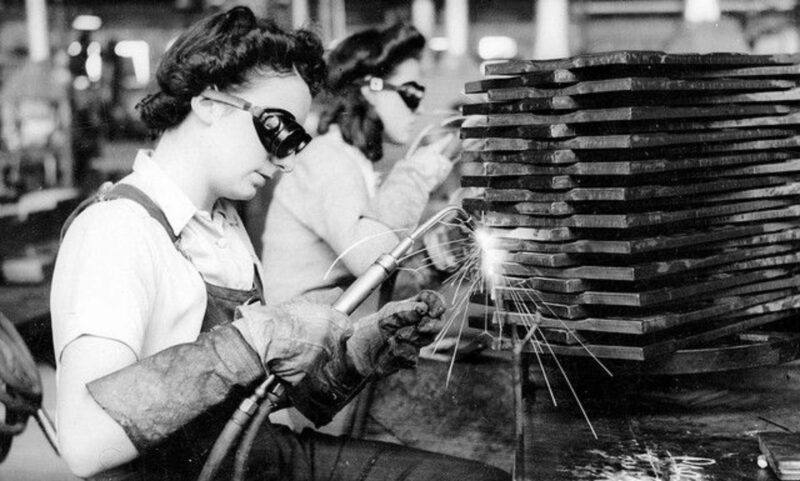 Its function was to survey factories and report on the condition of women in wartime industries. She also lectured trainee officers on awards, Factory Acts, etc. On returning to the ARU she was given the opportunity to speak to a wider audience of women by hosting a daily session on the Labor Council’s Radio 2KY. The Federal Government, on the recommendation of Albert Monk, President of the ACTU, appointed her as Australian correspondent of the International Labor Organisation (LO) Committee of Experts on Women’s Work, a position she held for 12 years. This activity required her fo conduct surveys on matters such as part time work, child care, wages”rates and discrimination. In 1951 Federal election she unsuccessfully contested the seat of North Sydney for the ALP. 1949 UN Commission on the Status of Women, Beirut. Australian Government Adviser. 1951 ILO Committee of Experts on Women’s Work, Geneva, Australian Member. 1961 International Alliance of Women Congress, Dublin, leader of Australian delegation. Leading up to the centenary of the ARU in 1986, the union received a grant from the Federal Government to research the Union’s history and the Branch Council established a committee to oversee the project. Members were: Jim Walshe, ARU Secretary;Harold Dwyer, ARU President; Greg Patmore, Lecturer, Department of Industrial Relations, Sydney University; Chris Bastic, NSW Ministry of Employment;(the late) Norm Garvey, former ARU officer~ EILEEN POWELL, Michael Easson, Assistant Secretary, NSW Labor Council; Mark Hearn, project coordinator; Marie Andrews, secretary and now State MP for Peats. The project led to the book Working Lives and a tape of the same title. Eileen’s input to this project was invaluable, particularly for those of us who were one and two generations separated from her. It made us realise the everlasting debt that the women of Australia owed this gentle but formidable woman of consequence.